Owners of much-loved family homes often take years to make up their minds to move to something smaller, but having taken that decision, they want to get the whole traumatic process out of the way as quickly as possible. As a result, a number of really good houses have come to the market in recent weeks, as vendors aim to catch the end of the late-autumn rally and snare some of the remaining buyers who have been frustrated this year mainly by lack of supply. For Diana Scott, owner of the Merton Grange estate at Gamlingay, near Sandy, on the Bedfordshire/Cambridgeshire border, it was always going to be a wrench to sell the charming 18th-century house that had been in her stepfather’s family since 1919, and where she herself has lived since 1958. But with Inheritance Tax payable on the property following her mother’s death earlier this year, the 7,100sq ft, 10-bedroom house which has a coach house and stables, four cottages and splendid Victorian barns and outbuildings set in 38 acres of wonderful gardens, parkland and farmland has been put on the market through Carter Jonas (01223 368771) at a guide price of £2.25 million for the whole, or in four lots. Another family house up for sale is substantial Jetwells on Cranbrook Road, near Goudhurst, Kent, a Queen Anne house, listed Grade II, with five acres of formal gardens and paddock, close to Benenden and Tonbridge and within the Cranbrook School catchment area, which is for sale through Knight Frank and Savills (01580 720161) at a guide price of £2.5m. For Peter Edwards of Knight Frank, Jetwells is ‘a proper country home’ with five reception rooms, nine bedrooms, four bathrooms, a conservatory and indoor and outdoor pools, whose owners have lived there happily for 18 years, but are ‘slightly rattling around in it’ now that their children have flown the nest. The delightful, long-established gardens, which have breathtaking views of the North Downs, are said to include the oldest azalea in Kent. 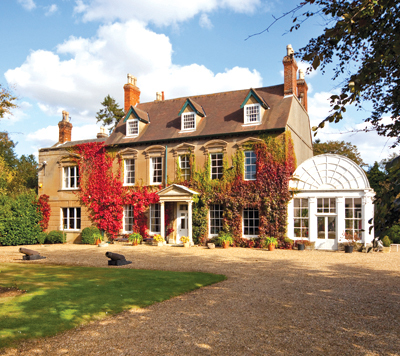 Having kissed the City goodbye, Jetwells’ garden-loving owners plan to move to the West Country, where Jackson-Stops & Staff (01823 325144) are handling the sale of the imposing Old Rectory at Thurloxton, six miles from Taunton, at a guide price of £1.25m. The former rectory, which dates from the mid 1800s, is a mix of Georgian-style and Victorian architecture with a much older wing to the rear. It stands on high ground on the edge of this peaceful Somerset village, with views across the Polden and Mendip hills towards Glastonbury Tor in the distance. Owners Tom and Siobhan Keeling have very carefully modernised the house, which has three reception rooms, a kitchen/breakfast room, six bedrooms and three bath/shower rooms, plus barns, outbuildings and stabling. They love the house, but with four young children to ferry around the county, they have less and less time to devote to the Old Rectory’s 3.7 acres of beautifully laid-out formal gardens and grounds, hence their decision to downsize. It’s a far enough cry from the Garden of England to Somerset’s cider country, but that’s nothing compared to the long-distance commute between Russia and the historic Cornish stannary town of Lostwithiel, 10 miles from the popular harbour town of Fowey, and 24 miles from Truro. That’s the remote-control lifestyle of the owner of Treganatha at Lostwithiel, who plies his trade in Russia, while his wife, who has family roots in Cornwall, looks after their three children and the substantial Victorian house they have lovingly renovated during their seven-year tenure. a guide price of £795,000. Up in Shropshire, Tony Morris-Eyton of Savills’ Telford office (01952 239500) quotes a guide price of £1.2m for the exquisite Old Vicarage at Market Drayton, whose owners are well ahead of the downsizing game, in that they’ve already bought a smaller house across the county border in Nantwich. According to Mr Morris-Eyton, there’s ‘not a penny to be spent’ on the Old Vicarage, an immaculate Georgian town house built in 1830 and meticulously maintained by its sexagenarian owners, who, he says, ‘are both perfectionists’. Approached through a gateway beside the church, the Old Vicarage has three main reception rooms, a kitchen/breakfast room, seven bedrooms, five bathrooms and a coach house, set in 1.3 acres of private walled gardens and grounds.